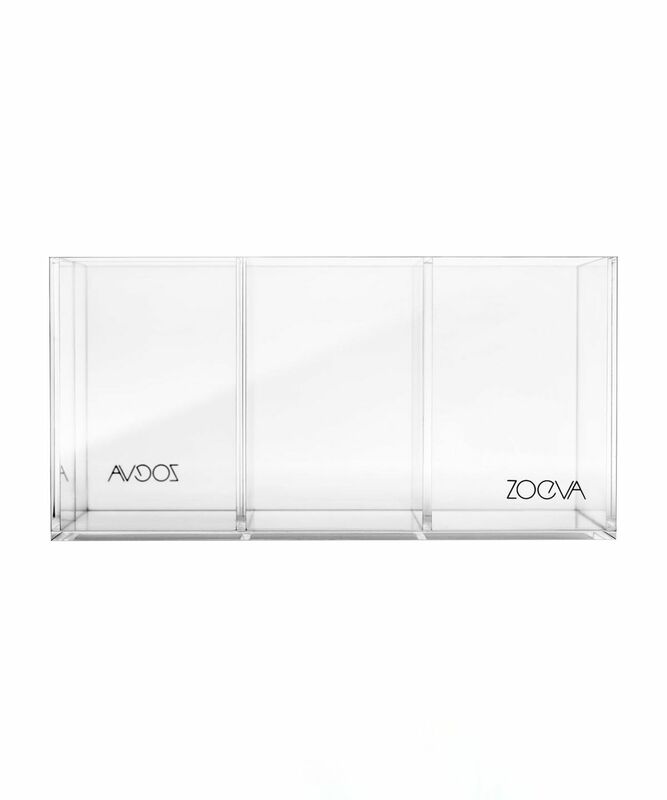 You’d think ZOEVA - a brand known for their professional, high-performing brushes - would have invented a convenient, hassle-free way to store them… and you’d be right. This convenient Classic Brush Holder is a great and hygienic way to keep your brushes tidy and secure when not in use (rather than have them rattling around in a drawer or on your dressing table). There are two larger compartments and two smaller ones, so that every manner of brush - from eyeliner to bronzer – can be stored with ease. Use the two smaller compartments to store thinner brushes for the eyes, brows and lips. Use the two larger sections for bigger brushes such as powder, blusher and bronzer. Perhaps it was my bad, but I expected this brush holder to be bigger than it was. I have a lot of brushes and although it serves the purpose of 'brush holder', you can get a better one for less money. 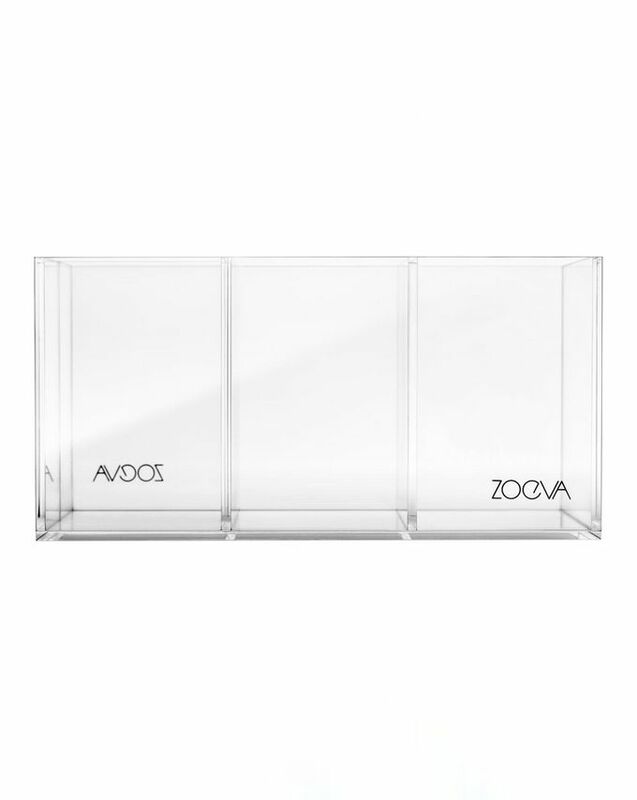 Granted, the Zoeva logo is cute and all, but for what it is, is expensive in my opinion. Ample space for all my brushes and due to the four different compartments I can separate all my makeup tools into type... I use the smaller compartments for eye brushes and out of the 2 larger one for base brushes and one for finishing brushes. Love the clear design as I can easily see smaller brushes that may otherwise go amiss. Really nice holder, I use this for my liquid lippies and lip liners and it can hold a lot. I generally love all things Zoeva and this is no exception. The three compartments are extremely spacious and hold a lot of brushes. I would definitely recommend this product to anyone who is looking for a brush holder. Great value for money too. This brush holder is sturdy and well designed with two large compartments, perfect for eye and face brushes and two smaller ones, which are great for storing lip liners, eye pencils and eyeliner pens. If you want to organise your makeup accessories/ tools, this holder is ideal and looks good too! Great brush holder, great quality, sleek packaging and more than enough room for your brushes for everyday use. I love these! I use them for my brushes, lip liners and eyeliners, concealers and primers. They are so useful! It’s perfect it has 4 compartments 2 larger ones for face brushes and 2 small ones for eye brushes excellent storage came really quick & was packaged well. This brush holder is great. It has 4 compartments, it is really handy for separating brushes for use. There are 2 smaller compartments, great for storing eyeshadow and other smaller brushes and then 2 bigger for face and other big brushes. I have a lot of brushes and this is great for storing them and because it has separate compartments I can always find the brush I want with out having to hunt for it.